1 Ph.D. in Economics, Lecturer, Department of Economics, Kwame Nkrumah University of Science and Technology. E-mail: dsakyi2003@yahoo.com. Mailing address: PMB, KNUST, Kumasi,Ghana. 2 Ph.D. in Economics, Professor of Economics, Department of Economics, University of Cantabria. E-mail: villavej@unican.es. Mailing Address: Avda de los Castros, s.n., 39005 Santander, Spain. Adjunct Professor, Kemmy Business School, University of Limerick, Limerick, Ireland. 3 Ph.D. in Economics, Professor of Economics, Department of Economics, University of Cantabria. E-mail: mazaaj@unican.es. Mailing Address: Avda de los Castros, s.n., 39005 Santander, Spain. 4 Ph.D Student, Center for Development Studies. E-mail: krishna08d@cds.ac.in. Mailing address: JNU, Kerala - 695011, India. This article was received on January 10 2012, and its publication was approved on May 22 2012. Palabras clave: apertura exterior, crecimiento económico, desarrollo, cointegración, países de renta media. JEL: F10, F43, O40, C23, E27. Keywords: trade openness; economic growth, development; cointegration; middleincome countries. JEL: F10, F43, O40, C23, E27. Cet article étudie l'impact de l'ouverture commerciale sur la croissance économique et sur le développement pour un échantillon de 85 pays à revenus moyens au cours de la période 1970-2009. Le document utilise des techniques de panel hétérogènes de cointégration non-stationnaires qui tiennent compte de l'impact de la dépendance transversale. L'analyse révèle trois conclusions importantes. Tout d'abord, l'ouverture commerciale a été l'un des principaux moteurs du niveau de développement, mais pas de la croissance économique dans les pays à revenus moyens. Deuxièmement, l'ouverture commerciale est à la fois une cause et une conséquence du niveau de développement dans les pays à revenus moyens. Troisièmement, négliger l'impact de la dépendance transversale surestime le coefficient lié à la relation de long terme entre l'ouverture commerciale et le développement. Mots-clés: ouverture commerciale, croissance économique, développement, cointégration; pays à revenus moyens. JEL: F10, F43, O40, C23, E27. According to economic analysis, one of the most important benefits associated with trade openness is the achievement of a faster and less volatile process of economic growth and development (Winters, 2004). For the developing countries to catch up with the more advanced ones, a higher and more sustained economic growth is required in the former (Mobarak, 2005). This implies that these countries require a huge amount of resources, which, to a certain extent, have to be acquired from advanced economies. The need for developing countries to get these resources led to their over-reliance on foreign aid, grants, and loans. Nonetheless, the quantum, quality, and timing of overseas aid, grants, and loans are often not only dependent upon economic conditions of developing countries but also on conditions rich countries impose on them; in particular, on the high servicing charges and repayment obligations such aid, grants, and loans carry with them. Here trade arises as an alternative to enable these countries to obtain the needed resources. Trade openness has been considered as one of the main policies expected to allow developing countries to alter both the pace, pattern, and structure of their participation in the internationalmarket scene, thereby overcoming balance-of-payments problems, accelerating technical progress, and hence promoting economic growth and development. In sum, it is considered that openness to trade helps to improve economic performance by increasing competition and by giving domestic firms access to the best foreign technology, which is very helpful to raise domestic productivity, and to better finance. Nonetheless, although trade openness has became an important policy variable for developing countries for the last few decades, its impact on economic growth and development has recently received a great deal of attention from academic researchers and policy makers alike, as many developing countries continue to embark on the liberalisation of their trading system and signing bilateral, regional, and multilateral trade agreements with other countries all over the world. In spite of this phenomenal policy change, the precise effect of trade openness on economic growth and development, at least for developing countries, still remains an open question as both theoretical and empirical studies have not yet provided a definitive conclusion (see, for example, Lopez, 2005). Many theoretical models have been proposed to explain how trade openness may, or may not, have a positive impact on economic growth and development (see Grossman and Helpman, 1990, 1991; Rivera-Batiz and Romer, 1991; Young, 1991; Romer, 1993; Mountford, 1998; Spilimbergo, 2000; Ben-David and Loewy, 1998, 2000, 2003; Perera-Tallo, 2003). For many empirical studies, on the other hand, the strength of the impact of trade openness on economic growth and development is often dependent on the econometric techniques used -time series, cross-section, or panel data-, how both economic growth and development and trade openness are measured5, the treatment of potential endogeneity of trade openness (Sachs and Wagner, 1995; Harrisson, 1996; Srinivasan and Bhagwati, 1999; Dollar and Kraay, 2004; Rodriquez and Rodrik, 2001), the time period and the country samples under consideration. For example, Srinivasan and Bhagwati (1999) have criticised cross-sectional regression methodology for reasons of its inappropriateness and weak theoretical foundations. This methodology and other homogeneous panel data methods often do not take into consideration potential cross-country heterogeneity. Moreover, the problem of cross-section dependence that arises from unobserved common factors or shocks is often not addressed. For these reasons, cross-sectional regression and homogeneous panel data methods, when employed in cross-country economic growth studies that often tend to exhibit high degree of cross-country heterogeneity and cross-section dependence may produce potentially biased and inconsistent estimates (see Pesaran and Smith, 1995; Lee et al., 1997; Pesaran, 2006; Phillips and Sul, 2003; Pedroni, 2007; Costantini and Destefanis, 2009). Bearing these considerations in mind, the main contribution of this paper to the existing literature lies in taking advantage of the recent development in non-stationary heterogeneous panel data techniques to examine the impact of trade openness on economic growth and development for a sample of 85 middle-income countries over the period 1970-2009; the idea is to determine whether these countries have benefited in terms of economic performance from international trade openness or otherwise. Specifically, we employ the Common Correlated Effects Mean Group (CCEMG) estimator developed by Pesaran (2006) and applied by Holly et al. (2010) and Cavalcanti et al. (2011). We further check the robustness of our results with the Group Mean estimators developed by Pedroni (2000; 2001) -the Fully Modified Ordinary Least Squares (FMOLS) and the Dynamic Ordinary Least Squares (DOLS). By using these estimators we are able to address econometric issues related to non-stationarity, parameter heterogeneity, endogeneity, omitted variable bias, and cross-section dependence, with the implication that our conclusions are more robust than those in previous papers. The rest of the paper is organised as follows. In section 1 we review the theoretical and empirical literature on the impact of trade openness on economic growth and development. Section 2 explains the empirical methodology. Section 3 discusses the empirical results. In the final and last section of the paper we offer our concluding remarks. Theoretical economic growth and development models -extended standard neoclassical exogenous and, endogenous economic growth and development models (see, for example, Grossman and Helpman, 1990, 1991; Rivera-Batiz and Romer, 1991; Spilimbergo, 2000; Ben-David and Loewy, 1998, 2000, 2003; and Perera- Tallo, 2003)- suggest that trade openness may contribute to economic growth and development by fostering technological progress and international and domestic competition. Although quite general, these theories sometimes differentiated between which group of countries -developed or developing- benefits the most from rade openness. Ben-David and Loewy (1998, 2000, 2003), for example, provide an extension of the standard neoclassical exogenous growth model to incorporate multi-country, open economy endogenous growth features. In these models economic growth depends on the rate of knowledge accumulation -which is facilitated through trade liberalisation policies. Focusing on the steady-state economic growth impact of trade openness, the authors show that all countries benefit positively from both unilateral and multilateral trade liberalisation. Ben-David and Loewy (1998), for example, note that more open economies face competitive pressures, and for firms in these economies to compete with foreign firms they need to incorporate foreign knowledge into their production processes. This is possibly achieved if countries liberalise foreign trade as it facilitates the diffusion of knowledge. Moreover, in endogenous growth models (see for example, Grossman and Helpman, 1990, 1991; Romer, 1993), trade openness fosters the flow of knowledge and ideas between countries. Spilimbergo (2000) developed a Ricardian model of international trade with nonhomothetic preferences and showed that a developing country liberalising its trade with a developed country can benefit more in terms of welfare gains. Therefore trade openness connects developing countries, in particular, to more advanced countries not only to acquire foreign exchange through exports, but most importantly through the access to intermediate and high-tech goods through imports, which facilitate the diffusion of knowledge and technology (see Feder, 1982; Grossman and Helpman, 1990, 1991; Rodrik, 1999; Almeida and Fernandes, 2008). Notwithstanding the theoretical support for trade openness as an economic growth and development enhancing policy variable, it must be admitted that trade openness can also potentially be detrimental to economic growth and development in the developing world through various channels. For example, as noted by Grossman and Helpman (1990, 1991), economic growth and development will be hampered if trade openness leads a country to specialise in sectors with comparative disadvantage in R&D activities. This is likely to be the case for countries at very low levels of development, due to human capital constraints and their inability to take advantage of international technology transfer (Kim, 2011). In addition, although in the context of an endogenous growth model, Perera-Tallo (2003) has shown that the level of income determines the degree of trade openness, so there are good reasons to believe that the degree of trade openness and the level of income are positively related as well, implying the possibility for long-run causality. Perera-Tallo (2003) however notes that, although trade openness may affect the level of income positively, it may not necessarily be robustly related to economic growth (and this effect may even be negative). The reason for this is that as trade openness increases over time -due to the expansion of the market base that leads to an increase in the level of income- the rate of income growth may decrease since the economy converges towards a steady-state. This potential no effect or even negative income growth effect of trade openness is in line with the endogenous growth model proposed by Young (1991). He notes that, under free trade, developing (developed) countries may experience income growth less than or equal (greater than or equal) to those experienced under autarky. Yet another important explanation for this potential low income growth effect of trade openness for developing countries -as compared to the developed countries- may be that there is an income level (or level of development) below which more trade openness has detrimental consequences for economic growth (see, for example, Kim and Lin, 2009; Kim, 2011). Therefore, although trade openness may have a positive effect on the level of income, it may not necessarily have a positive growth effect for developing countries. Leaving aside theoretical reasoning, it is also important to note that the empirical evidence on the impact of trade openness on economic growth and development is also mixed and inconclusive. Several empirical studies support a positive impact of trade openness on economic growth and development. 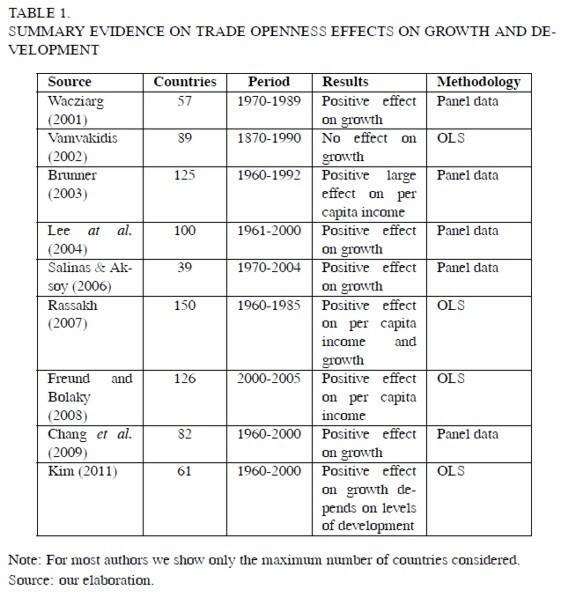 Harrison (1996) used alternative openness measures to investigate the relationship between trade openness and economic growth for developing countries for the periods 1960-1987 and 1978-1988. For most openness measures Harrison concluded that more trade openness is associated with higher economic growth. Frankel and Romer (1999), in an attempt to control for potential endogeneity of trade openness, used geographical components of trade to construct a measure for trade openness. Their results revealed that trade openness has a positive effect on income levels, although this effect is moderately statistically significant. Wacziarg (2001) studied the relationship between trade openness and economic growth for a panel of 57 countries over the period 1970-1989 and concluded that trade openness has a positive and significant impact on economic growth. Vamvakidis (2002) studied the same relationship using historical data for the period 1870-1990, and concluded that the positive openness-growth link is rather a recent phenomenon, mostly driven by the unprecedented expansion in world trade, which began in the 1970s. While no significant positive relationship was found for periods before 1970, the period 1970-1990 showed a significant positive effect of trade openness on economic growth. Irwin and Tervio (2002) used data for the pre-World War I, the interwar and the post-war periods to investigate the effect of trade openness on income, concluding that, even after controlling for endogeneity problems, trade openness affects levels of income positively. Brunner (2003) used a dynamic panel data model to study the impact of trade openness on the level of income and income growth for a sample of 125 countries for the period 1960- 1992, and concluded that trade openness has a significant large effect on the level of income, but small and non-robust effect on income growth. Lee et al. (2004) investigated the relationship between trade openness and economic growth for a sample of 100 countries for the period 1961-2000. Using identification through heteroskedasticity to address potential endogeneity of trade openness, they concluded that trade openness has indeed increased economic growth for these countries, although this effect is small in magnitude. Salinas and Aksoy (2006) employed multivariate fixed effects estimations to assess the impact of trade openness on economic growth over pre and post trade liberalisation periods and concluded that, the post-liberalisation period saw an increase in economic growth of about 1.2 percentage points higher than the pre-liberalisation period. Rassakh (2007) used the empirical model of Frankel and Romer for a sample of 150 countries to investigate the impact of trade openness on levels of income and the rate of income growth, and concluded that trade openness benefits the developing countries (i.e. low-income countries) more than the developed ones. Freund and Bolaky (2008) studied the relationship between trade openness and levels of income for a sample of 126 countries and found this effect to be positive, but only for well regulated economies. Chang et al. (2009) investigated the effect of trade openness on economic growth for 82 countries (that included 22 developed and 60 developing countries) for the period 1960-2000, and concluded that, generally speaking, trade openness is positively related to economic growth. The study further revealed that this association can be enhanced significantly, particularly for developing countries, if trade reforms are combined with labour market flexibility, human capital formation, inflation stabilisation, financial development, public infrastructure, and governance reforms. More recently, the study by Villaverde and Maza (2011) conducted for a sample of 101 countries and the period 1970-2005 also shows that economic globalisation (for which trade openness is one of the main indicators) has conducted to a higher economic growth and, simultaneously, to worldwide income convergence. On the contrary, there are also some empirical papers casting doubts about the relationship between trade openness, growth, and development. In fact, recent empirical investigations by Dowrick and Golley (2004), Kim and Lin (2009), and Kim (2011) have shown that trade openness benefits rich countries more than poor countries due to poor countries' inability to take advantage of knowledge accumulation and technology spillovers. This is also the case because as Kali et al. (2007) noted, not only the volume of trade matters, but also the structure of international trade has significant implications for economic growth and development. They emphasised that the number of trading partners that a country is able to benefit from is crucial for the impact of trade openness on economic growth and development, and that less developed countries stand to lose from this advantage. In addition, what a country actually exports (i.e. either capital intensive, manufactured, or primary products), for example, matters as well for its potential benefiting from international trade. These arguments imply that not all countries take advantage from trade openness, and that the level of development already attained by a country and the structure of its international trade critically determine if trade openness impacts positively on economic growth and development. As can be seen, there is vast literature on the topic of the relationship between trade openness, growth, and development. Then, to conclude this section with an attempt to offer a snapshot of the current state of knowledge on this issue, Table 1 reports a summary of the main papers devoted to it from 2000 onwards. where Yit is real per capita income of country i in year t; OPENit denotes trade openness; log is the logarithm operator; αi is the country-specific fixed effects; εit is the error term; and βi the country parameters related to trade openness. An important feature of our model is that we do not impose a common β coefficient among all the countries under analysis. As mentioned in the introduction of the paper, the parameter β is allowed to be heterogeneous between countries. This being so, we are interested in the average value of βi namely β. In otherwords, and following the methodology proposed by Pesaran (2006), β = N−1∑Ni =1 βi is the parameter of interest to be estimated, reflecting the long-run relationship between trade openness and per capita income. Regarding the short-run dynamics and their adjustment to the long-run, they are accommodated through the error term, which has a multifactor error structure (∈it = ω´iƒt + eit, ). The specification of the error term, as well as Pesaran's proposal, is thoroughly explained below when it comes to dealing with estimation issues. We have used a balanced panel data consisting of 85 middle-income countries for the period 1970-2009. Annual data on trade openness and real per capita income are obtained from Penn World Tables Version 7.0 (Heston et al., 2011). Although the World Bank classifies 110 countries as middle-income economies6, the data is available for only 85 of these countries for the period considered. It is important to note that the trade share in GDP (i.e. Exports + Import/GDP) is the most commonly used proxy for trade openness as the trade performance of countries captures the most important dimension of openness in general. However, we define trade openness in real terms (i.e. trade openness based on constant 2005 PPP dollars). In like manner, real per capita income is measured based on constant 2005 PPP dollars. 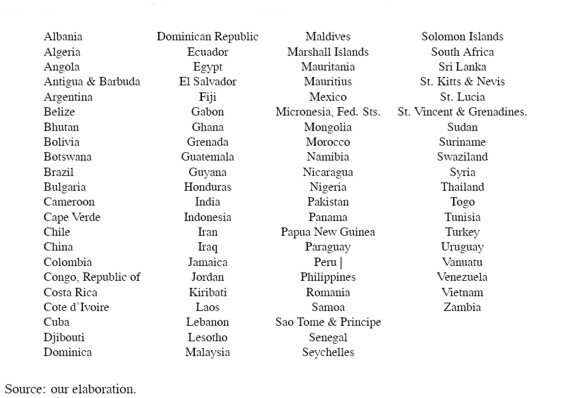 The list of countries considered in the study is presented in Appendix 1. To obtained consistent estimates for Eq. we need to address several econometric issues that arise. Firstly, as noted in the introduction, an important issue of cross-section dependence -which results from unobserved common shocks or factors- needs to be taken into consideration. If there is a problem of cross-section dependence and it is not properly accounted, the estimated β and its associated standard error will be biased and inconsistent (see Driscoll and Kraay, 1998; De Hoyos and Sarafidis, 2006, Costantini and Destefanis, 2009, Holly et al., 2010). For this reason, we first determine whether the error term ∈it in Eq. and the OLS residuals from ADF(p) regressions of the log Yit and log OPENit across all the 85 countries in the panel over the period 1970-2009 are not plagued by cross-section dependence. The cross-section dependence (CD) test (Appendix 2) clearly indicate that the log Yit and log OPENit, as well as the error term εit in Eq. , are plagued by cross-section dependence. Secondly, by the application of panel cointegration techniques to establish a long-run relationship in Eq. , we are assuming that both log Yit and log OPENit are integrated of order one, or I(1) stationary, and cointegrated. The existence of cointegration between log Yit and log OPENit means that the error term, εit is stationary or I(0), implying that Eq. is also not plagued by the omitted variable problem (see Herzer, 2010; Cavalcanti et al., 2011). For these reasons, if these conditions are satisfied inference based on the long-run relationship in Eq. would not be spurious, and the shortrun dynamics, and their adjustment to equilibrium in the long-run across countries can easily be captured, as we mentioned in the model specification, through the error term, Εit (see Holly et al., 2010). To determine whether the variables in Eq. exhibit unit root properties and are cointegrated, and taken into consideration the problem of cross-section dependence, we make use of panel unit root and cointegration tests that treat this effect. The panel unit root (Appendix 3) and cointegration (Appendix 4) tests show that all variables exhibit unit root properties and are cointegrated. We have established in the previous section that the variables in Eq. exhibit unit root properties and are cointegrated. This section, devoted to the empirical results and discussion, begins with the long-run panel estimates. We then follow it up with the robustness of the results and conclude the section with causality issues. The causality analysis will not only allow us to capture the long-run direction of causality between trade openness and levels of income (levels of development), but most importantly, the short-run (growth) effects. where the included cross-sectional averages and only serve as proxies for the common factors and may not have any interpretable meaning (see Pesaran, 2006). The coefficient of interest is computed as the simple average of the N countries . To enable comparison of the results, we also compute the traditional mean group (MG) estimates of Eq. , which does not take account of cross-section dependence by assuming independent errors. The estimated MG and CCEMG results are reported in Table 2. As evident, the long-run relationship between trade openness and the level of income is positive and highly significant in both estimators (at least at the 5% level). However, we observe, on the one hand, that the mean coefficient β is much bigger in the MG estimate than in the CCEMG and, on the other, that the MG estimate is biased given the high degree of cross-section dependence unveiled by the CD test statistic. These results reveal that neglecting the impact of cross-section dependence can bias upwards the coefficient of the estimated long-run relationship; the difference between estimates, furthermore, is significant enough to assert that researchers should not overlook this issue, as has been common practice so far. In addition, the CCEMG estimator has led to a significant reduction of crosssection dependence inherent in Eq. and thus provides us with the true mean coefficient β. To check the robustness of Pesaran’ CCEMG results presented in Table 2, we use the group mean Fully Modified OLS OLS (DOLS) proposed by Pedroni, where the impact of cross-section dependence is captured through common time effects (Pedroni, 2000, 2001). According to Pedroni (2001), these two estimators -which are based on the between dimension of the panel- are promising in estimating the true mean value of β in Eq. in heterogeneous cointegrated panels. This author suggests that, by using FMOLS and DOLS estimators, a consistent and efficient estimation of cointegration vector is achieved, in particular where non-stationarity, endogeneity of regressors, and serial correlation problems are suspected. denote lower triangular decomposition of . where λij denote the coefficients of the augmented lag and lead differences, which account for any potential endogeneity and serial correlation problems. The estimated β is computed as the simple average of the long-run DOLS estimates for each N in the panel (i.e. ). 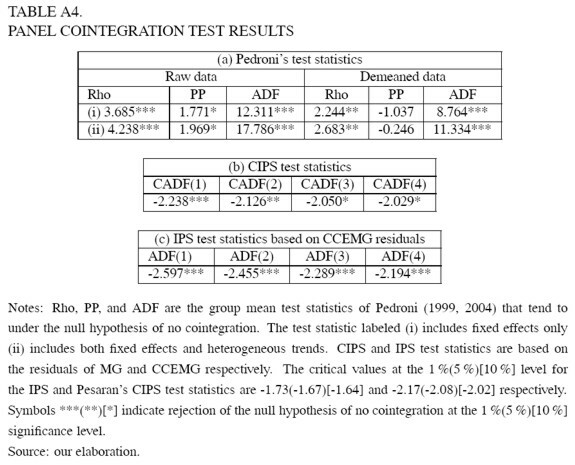 The estimated long-run results using Pedroni’s group mean FMOLS and DOLS with and without the inclusion of common time effects are reported in Table 3. Consistent with the MG and CCEMG results (Table 2), we observe a positive and statistically significant relationship between trade openness and the level of income in all cases. In addition, the mean coefficient β is bigger for both estimators if we use the raw data that do not account for cross-section dependence. However, the estimated β is much small and comparable to the CCEMG result in estimates with common time effects. The result clearly shows that although trade openness has significant positive impact on the level of income, this effect is much smaller once econometric issues are well addressed. where Δ is the first difference operator, Δlog Yit is the rate of economic growth, ecti,t-1 is the lagged error correction term computed from the long-run cointegrating relationship of Eq. , in which ecti,t-1 = log Yit - ˆα- ˆ βi logOPENit. We first determine whether the coefficients on the lagged error correction terms are different from zero (i.e. κ1 ≠= 0 and κ2 ≠ 0). If this were not the case for at least one of them, we would not be able to rely on the panel cointegration results, which establish a long-run cointegrating relationship between trade openness and the level of income, and hence there would not be any evidence for long-runGranger causality. On the contrary, if at least one of the adjustment coefficients was non-zero, we -would be able to determine the direction of long-run Granger causality by implementing a χ2 -test for the null hypothesis of long-run Granger non causality on the coefficients on ecti,t-1. Secondly, we determine whether there is any evidence of short-run Granger causality by implementing a χ2 -test for the null hypothesis of short-run Granger non causality on the lags of the short-run coefficients (χ). To implement the short and long-run Granger causality we estimate equations  and  by both the MG (which does not account for cross-section dependence) and the CCEMG (which accounts for cross-section dependence). The results are reported in Table4 As the CD test statistics clearly show (see last row of the table), there is a high degree of cross-section dependence for the MG estimates, but virtually no evidence of cross-section dependence for the CCEMG estimates. For this reason, we are unable to rely on the MG estimates for inference. So, focusing our comments on CCEMG results, it can be seen that the adjustment coefficient is negative and highly significant (at the 1% level) in all cases, indicating that the long-run cointegrating relationship between trade openness and the level of income truly holds. The rejection of the χ2 -test for the null hypothesis of long-run Granger non causality on the coefficients of ecti,t-1 indicates a long-run bi-directional Granger causality between trade openness and the level of income. Nonetheless, there is not enough evidence to reject the null hypothesis of short-run Granger non causality between trade openness and economic growth in both directions. Summing up, we are thus able to conclude that, although the hypothesis of short-run non causality cannot be rejected, the long-run causality for middle-income countries is bi-directional, suggesting that trade openness is both a cause and a consequence of development, that is, higher development degrees (and associated productivity gains) encourage firms to explore external market opportunities. This paper has investigated the impact of trade openness on economic growth and development of 85 middle-income economies over the period 1970-2009. In order to do so, it has made use of several heterogeneous panel cointegration techniques that are robust in the presence of non-stationarity, endogeneity and cross-section dependence and which offer more reliable results than conventional approaches. The main conclusions of the paper are that there is a significant long-run relationship between trade openness and development, and that this is bi-directional, this implying that higher development tends to increase trade openness and vice-versa. The existence of a short-run interaction between these two variables is not, however, supported by our empirical investigation. This is on a priori basis a quite surprising result, but it is convenient to note that it is in line with the theoretical model by Perera-Tallo (2003). A tentative explanation of this result is that the effect of trade openness will lead to a reallocation of resources, in favour of economic activities in which developing countries are more competitive, only in the medium/long-run. Accordingly, and although in the short-run policies devoted to foster openness cannot have the desired effects, these prove to be very fruitful in the long-run and, therefore, they should be implemented by developing countries. 5 In most recent studies the level of development is proxied by the level of per capita income while economic growth is proxied by the rate of income growth. 6 We have combined the countries in the upper-middle-income and lower-middle-income groups (see World Bank classification of economies, July 2011, http://data.worldbank.org/about/countryclassifications/ country-and-lending-groups). Before we proceed to test for panel unit root in log Yit and log OPENit, we first determine whether these series are plagued by cross-section dependence. This will allows us to employ an appropriate panel unit root test, as traditional tests are not valid in the presence of this type of dependence. The CD test we use is the one proposed by Pesaran (2004), which is robust in the presence of structural breaks and appropriate for T < N heterogeneous panels. The CD test, which tends to N(0, 1) under the null hypothesis of no cross-section dependence asN tends to infinity, is based on the average of the pair-wise correlations of the OLS residuals from the individual regressions in the panel (i.e. (see Pesaran, 2004). TheCD test statistics (Table A2.1) show strong evidence of cross-section dependence regardless of the pth-order Augmented Dickey-Fuller ADF(p) test statistic used. Following the procedure proposed by De Hoyos and Sarafidis (2006), we also test for the null hypothesis of no cross-section dependence in the error term εit in Eq. . To determine the extent to which the inclusion of common time effects eliminate cross-section dependence, we estimate Eq. with and without them. The CD test results on the residuals in equation , reported in Table A2.2, clearly show the presence of considerable cross-section dependence in the model without common time effects as the test strongly rejects the null hypothesis of no cross-section dependence at the 1% level of significance. However, through the inclusion of common time effects we are able to significantly reduce the impact of cross-section dependence. The result clearly indicates that we are able to rely on estimators that account for cross-section dependence through common time effects, in particular, as it is not statistically significant at the 5%level. The presence of cross-section dependence implies that we are unable to rely on panel unit root tests that do not control for this effect. 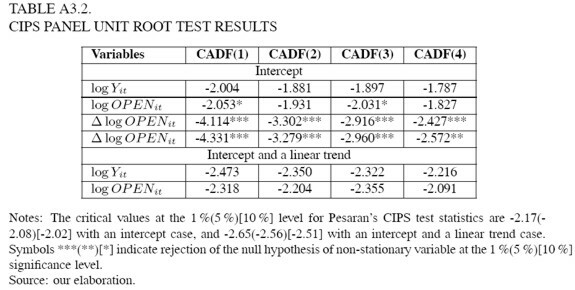 For this reason, we make use of two panel unit root tests adapted to the case of cross-section dependence: namely, the Im, Pesaran, and Shin (IPS) test and the crosssectionally augmented IPS (CIPS) test, proposed by Im, Pesaran, and Shin (2003) and Pesaran (2007) respectively. 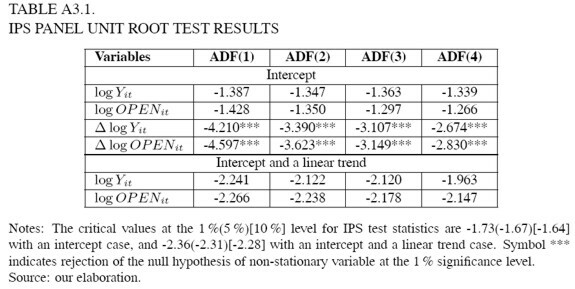 The IPS test does not control for cross-section dependence, but we implement this test based on demeaned data as suggested by Levin et al. (2002). Both tests incorporate cross-sectional heterogeneity. The panel unit root test statistics, reported in Tables A3.1 and A3.2, allow us to treat both log Yit and logOPENit as I(1) variables. Once it has been proved that all the variables are I(1), the next step is to determine whether the series are cointegrated to avoid spurious regressions problems. In order to do this we applied several tests, all of them suggesting that the series are indeed cointegrated (Table A4).